This Indian twist on nachos made with Butter Chicken Sauce can be served for lunch or dinner, and makes a crowd-pleasing party appetizer, too. Preheat oven to 400°F (200°C). Heat oil in large skillet set over medium heat; cook pepper for 3 to 5 minutes or until starting to soften. 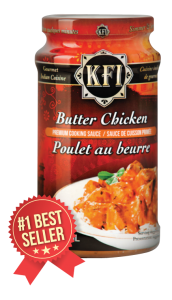 Stir in KFI Butter Chicken sauce, chicken, black beans and corn; bring to simmer. 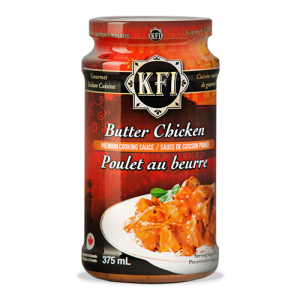 Cook, stirring frequently, for about 3 minutes or until chicken is heated through. Toss together Cheddar, mozzarella and Swiss cheese. 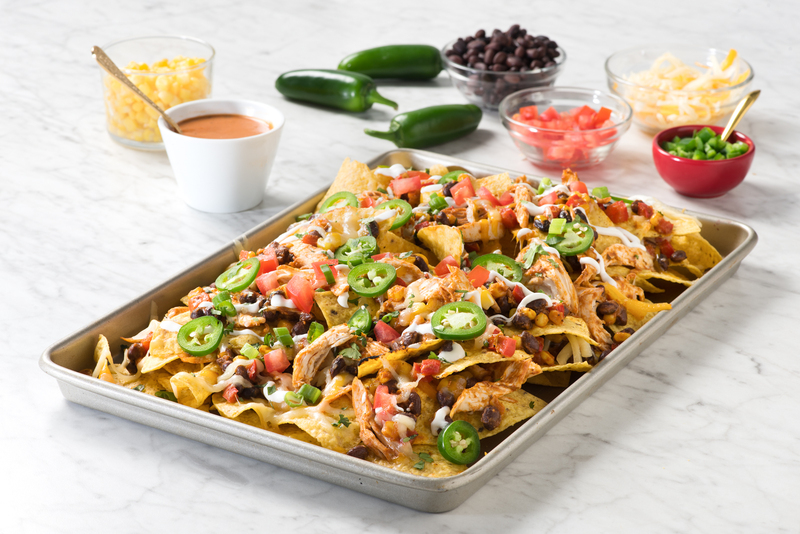 Spread half of the tortilla chips on parchment paper–lined baking sheet; scatter half of the chicken mixture and half of the cheese mixture on top. Repeat layers. Bake for about 10 minutes or until cheese is melted. Drizzle sour cream over top. Sprinkle with tomatoes, green onions, cilantro, and jalapeño (if using). Serve immediately.